The membranous labyrinth lies enclosed in the very hard petrous part of the temporal bone and, as the name implies, its structure is extremely complex. This may explain why our knowledge of this organ and the vestibular sensory regions within it, is not yet satisfactory. In recent years the rapid development of space research has provided a power- ful stimulus to our interest in the vestibular apparatus. 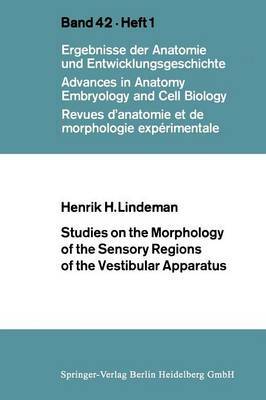 This has found expression in annual symposia, in which the role of the vestibular organs in the exploration of space is discussed. However, little is known as yet about the influence upon the equilibrial apparatus, during space flight, of weightlessness and other related conditions. The inner ear has also acquired increased significance from an otosurgical point of view. Operations are today performed in regions previously inaccessible to surgery. This requires exact knowledge of anatomical details and of relations between the different structures in the inner ear.